I was lucky to able to read an advanced copy of the novel. This is a novel smelling of time, dusty manuscripts, bees, and amber, and it is steeped in the terminology and beliefs of medieval alchemy. It is set years before The Alchemist’s Council. At first I was confused by the jumping around between the various times and between the council and rebel groups, but as I read on I saw that a pattern was emerging, very like the delicate patterns and clues scattered in the various manuscripts. I found Genevre the most compelling of the characters, although the relationship between Ilex and Melia with its challenges and almost smothering nature was also fascinating. I don’t want to give too much away, but conjunction is a key concept in understanding this world. Love and loss are movingly described. There’s also a sense of menace or perhaps more accurately of disturbance here. I enjoyed the ambiguity and became more and more unsure of who to trust, but that’s part of the pattern that Masson weaves. Most of all I love how it’s about words: specific words, invocations, words appearing on velum pages. As in the earlier novel the descriptions of the settings are beautiful, embroidered and glittering as in Milton. As well as the Miltonic references there are others to Yeats and Shakespeare which add to the novel’s richness. There is a point where suddenly a key scene from the first novel is turned on its head and expanded on, and from then on the novel explains much that we didn’t know when reading the first in the trilogy; I won’t write more! I highly recommend this fantasy novel and look forward to the concluding volume. 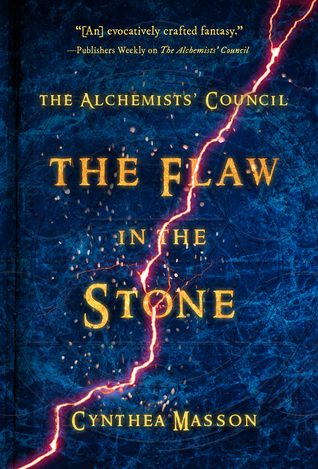 Sign into Goodreads to see if any of your friends have read The Flaw in the Stone.